Sometimes, rather than experimenting with a sweet potato soufflé or a Bourbon coconut cranberry relish for the most important meal of the year, all you want a simple dish that’s sure to deliver. 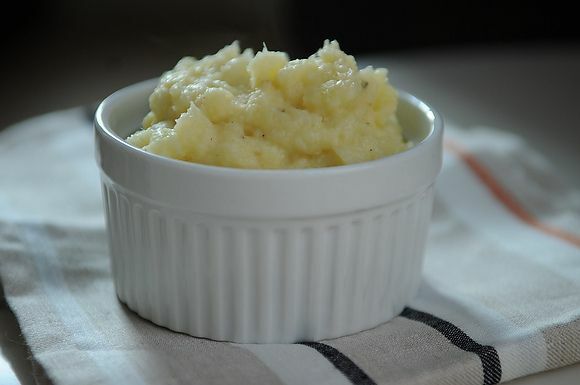 This parsnip and potato mash is one of my tried-and-true favorites. It’s a cinch to make, it will hold for a couple of days if necessary, and it provides a welcome break from plain old mashed potatoes. Hope you like it as much as I do! 1. Combine the garlic, parsnips, potato and enough stock to cover the vegetables in a large saucepan. Add a generous pinch of salt and bring to a boil over high heat. Reduce the heat and simmer for about 20 minutes, until the vegetables are quite tender. 2. Scoop out about a cup of the hot stock and set aside. Drain the vegetables and return them to the pot. Mash with the crème fraiche and butter, leaving the mixture slightly chunky. (You can use a food mill or a ricer if you prefer a smooth puree.) If the mash seems at all dry, stir in some of the leftover stock, and keep the rest for just before serving. 3. Stir in the nutmeg and season with salt and pepper to taste. Keep warm and covered, reheating over medium-low heat just before serving and adding a little more stock if necessary. This can be made a day or two ahead of time and refrigerated. ooh -- sounds so yummy! I love parsnips! Someone else is bringing the mashed potatoes on Thursday, so I will tuck this one away for pot roast coming up soon. Thanks and a very Happy Thanksgiving to you and your family! What a wonderful dish for the holidays! I spy crème fraîche! This sounds yummy, Merrill. Thanks. By a yellow potato, do you mean like a Yukon Gold? You caught me! And yes, Yukon Gold would work well.